Today, I am pleased to welcome Jon Skovron on to the blog today to talk about his visit to London as a teenager. 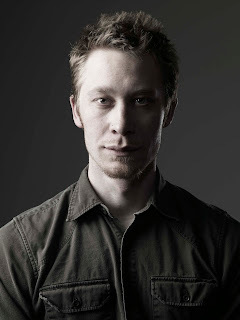 Jon is the author of Misfit and Struts and Frets. 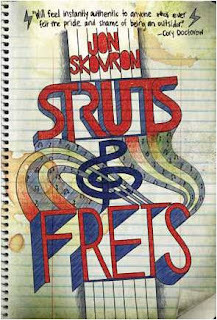 There is a competition at the end of this post, to win a copy of Struts and Frets which I will be reviewing on the blog at 3pm this afternoon. It was my sophomore year in high school and things were going great. I was doing well in school, playing guitar in an awesome band, dating a hot girl, and hanging out with a bunch of bizarre, creatively-minded friends. I also started doing more theater and had been cast in a couple of lead roles. And to top it all off, I had become edgy and volatile enough that the jocks who had picked on me so much in middle school stopped hassling me and even gave me a nod in the hallway now and then. My reign as angsty artist badboy of St. Charles Preparatory High School was just beginning. Or so I thought. But the spring school play was a musical and since I couldn’t dance to save my life, I was cast in a tiny part with only one line. Then my band broke up. Then my hot girlfriend cheated on me. Then a bunch of my bizarre creatively-minded friends decided they’d rather go to the arts magnet high school instead of dealing with our strict conservative Catholic school anymore. By the end of sophomore year, I was lonely, miserable, and depressed. My problems felt so big and overwhelming that I didn’t think I’d ever be able to recover from them. It felt like the world was against me. I did a lot of really stupid, self-destructive stuff. It was tradition for my parents and I to travel for a week or two every summer. Usually we went somewhere in the Western part of the US, like California, Seattle, or Arizona. When I was a kid I loved these vacations because they felt like we were going on adventures. But as I got older, the family vacations got less and less fun until the idea of spending a solid ten days with my parents was something I started to dread. And I’m fairly sure they felt the same. So they decided we should have one last family vacation. This time I could bring a friend, and we would go to the place I had been begging to go to for years. London, England. I’d always been a bit of an Anglophile at heart. Or as much as a boy from the midwestern United States with little cash in a pre-Internet world could be, I suppose. I adored the writings of Douglas Adams, the antics of Monty Python, and the music of the Clash and the Cure. My parents made us do all the touristy things while we were there, of course. Buckingham Palace, Tower of London, Jack the Ripper Walking Tour, an “authentic high tea”, and some museums. But my friend Ryan (one of the defectors to the arts magnet school, curse him!) and I were also given time to ourselves and unlimited ride Tube passes. We roamed the city at will, soaking up the sights, the sounds, and the people. It was the first city I ever fell in love with. in a mid-sized midwestern town that could truly be called “mostly harmless” were really small when you compared them to this wider world that I was just beginning to see. A lot of that trip was a blur, frankly. But there was one thing I remembered with absolute clarity. Ryan and I would sneak out of the hotel at night after my parents went to sleep so that we could smoke cigarettes. We found a small green space nearby called Grosvenor Square. In that square there was a statue of President Franklin Delano Roosevelt. Every night we sat in the cool evening air and smoked a cigarette beneath that statue. I found it a little funny that FDR was standing. Even I knew that he had been crippled by Polio. But I also found it strangely comforting to be in this strange land under the watchful eye of the man my grandfather, a veteran of World War Two, had called “our greatest president”. One night as I sat beneath the wise gaze of FDR, and thought about this great big city I realized that it didn’t actually bother me that I had been shown how small and inconsequential I was. Because if I small, that also meant that my problems, which had seemed so massive and overwhelming, were also pretty small. The world wasn’t out to get me. In fact, it probably barely noticed my existence. For some people that might have been a little depressing, but for a single child who’d always been under enormous pressure to be “successful”, it was incredibly liberating. It meant I could fail and life would just keep going. And so would I. Some stories are big, sprawling things that span time and space and shake the foundations of reality. My novel Misfit is that kind of story. And I love those kinds of stories. But there are other kinds of stories. Small, quiet stories about love, family, friendship, and reaching for your dreams. Struts & Frets is that kind of story. And just because it is smaller and quieter doesn’t actually make it less important. In fact, sometimes these are the stories that sustain us the most. Because they make us feel less alone. That following year, my junior year in high school, I was cast in lead roles in plays again. I started a new, better band. I got a new girlfriend. I made new friends and figured out how to still spend time with the old ones. Five years later, after graduating from high school and studying theater in an acting conservatory, I returned to London in a touring company as the lead in a Neil Simon play and had many strange adventures. But that’s another kind of story entirely. London seems to have left quite an impression on Jon, I think. Struts and Frets was published by Amulet Books, an imprint of Abrahms and Chronicle on the 1st of September and is available to buy from all major book stores. The next stop on the tour is Mountains of Instead, stop by tomorrow, for another fab post. 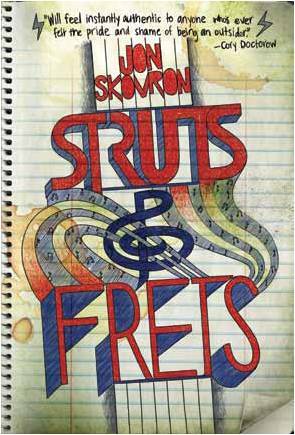 To celebrate the publication of Struts and Frets, I have one hard backed copy to give away - UK only this time. The closing date is Monday 3rd of October. Thanks to both yourself and Jon for such an interesting post, I shall be back later to read your review of Struts And Frets. Good luck all who enter you giveaway though I'm of course hoping it will be me who will win. I believe that this is the most interesting guest post I've ever read. I was just sucked into it by Skovron's writing. I haven't read ny of his books but I'm guessing I could fall in love with his writing :) +It really made me want to visit London.